Recent Leaked called recordings revealed Egyptian political activists, the spearhead of the 25th revolution! spying and conspiring on Egypt during and after the 25th of Jan 2011. All masks are off now. I see you all naked, despite that you are wearing clothes. Those who claimed that they were religious and they were serving the country only for God’s sake and for the sake of the country. Those who claimed that they made the 25th of Jan revolution, so poor people in Egypt and ignorant will have a better decent living and a better education, all these claims were just a big fat lies. Those who claimed that they revolted for social justice and they couldn’t sleep because there is no justice or equality in Egypt, those who claimed that no one is above the law and they were against corruption. They were not honest as they claimed, they were not against corruption, but they are the “Corruption”. All they cared about, was money, fame, sexual relationships, and they accepted to betray their own country and their own people by putting their dirty hands in the hands of Egypt’s enemies and all those who want to destroy our country. 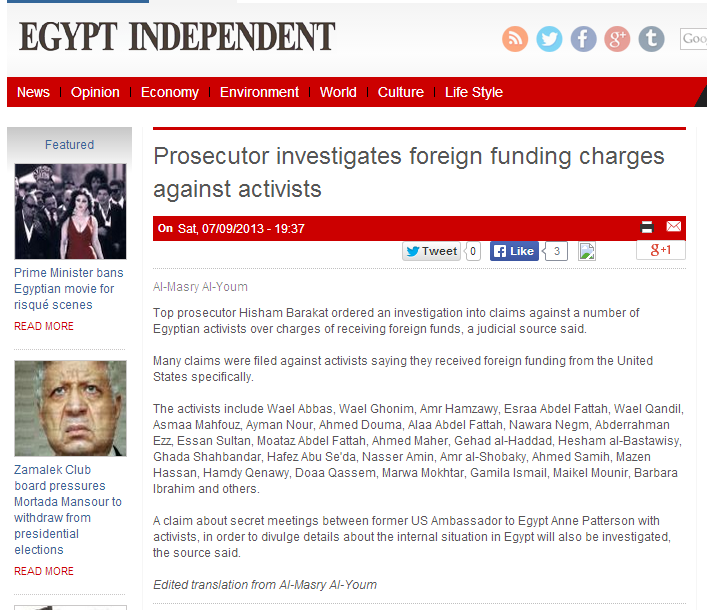 Those political activists didn’t mind to cooperate with foreign Intelligence to spy on Egypt, they didn’t mind to cooperate with Muslim Brotherhood terrorists organization to destroy the country, they didn’t mind as long as this cooperation will fill their banks accounts. 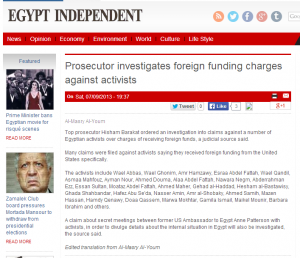 The US administration led by Obama Bin Lying, foreign NGOS, foreign politicized media and human rights organizations are not defending those political activists for the beauty of their eyes, they are panicking from what will be exposed of their dirty deals in conspiring and spying on Egypt. US created terrorists and financed them from the American tax payers money, as they supported and financed the 5th column and the sleeping cells of Muslim Brotherhood and the Egyptian political activists to spy on Egypt and to destroy the country from within. Abd Elrehim Aly, journalist and Chief Editor of Albawaba news, published more leaked call recordings and as a journalist, he has the right not to reveal the source of these recordings. The following video, Wael Ghoneim and other political activists (Google manager in the Middle East and political activist) breaking into the National security building and stealing documents and files concern Egypt’s national security. Call recording between Wael Ghoneim political activist and manager of Goggle in the Middle East and Wael Abbas another political activist. In this call Wael Ghoneim asked Wael Abbas to launch an insult campaign on twitter against Mohamed Elbeltagy (Muslim Brotherhood leader) for interrupting the former prime minister Issam Sharf during his speech and was inciting to dissolve the National security institution in Egypt. Wael Abbas told Ghoneim that he was not going to launch this insult campaign because Mohamed Elbeltagy is a respectable Muslim Brotherhood leader and they also work on the same goal of Muslim Brotherhood in dissolving the National security institution. Ghoneim told Abbas that he was not against dissolving the National security, but he was just against Beltagy’s interruption to the Prime minister. Ghoneim asked Abbas why he defended the Muslim Brotherhood leader. He said because his relationship to Muslim Brotherhood is good and their goals are mutual. Ghoneim said that they must dissolve the national security institution and not to stop till they get this institution down. Abbas told Ghoneim, to totally ignore the main role of National security in fighting terrorism, the goal is to get them down and break this institution. Call recordings between Mostafa Alnagar, political activist and Abd Elrahman Youssef AlQaradawy another political activist and son of Youssef AlQaradwy, Muslim Brotherhood cleric enjoying luxury in Qatar and inciting Obama and the west to invade Egypt and to get back Muslim Brotherhood to power by force. 1st Part: Abd Elrahman AlQaradawy was making fun of Mostafa Alnagar’s recent activities in the media. He told him that he was a great actor and he almost believed that he really stands for “Justice”, he praised his recent activities that serve their targets. Alnagar responded to Abd Elrahman, that these activities were necessary to reach their target. Mustafa Alnagar told Abd Elrahman that the Muslim Brotherhood praised all their activities. He told him that he had a meeting with Ibrahim Almoallem (Muslim Brotherhood media marketer and chief of Shorouk newspaper). Abd Elrahman replied that Naguib Sawiris (wealthy business in Egypt) also expressed his satisfaction of Alnagar’s activities. Alnagar tried to convince Abd Elrahman to join their new political party, but Abd Elrahman said that the has a condition to join their political party. Abd Elrahman Youssef told Mostafa Alnagar that his condition to join his political party is to give him sexual inspirations. Alnagar assured Abd Elrahman that if he joins the party, he will be astonished of the pretty attractive high class women who joined the party and he will find what he is looking for. He invited him to go and take a look on the merchandise! This is another ugly truth how these activists who still claim that they stand for women rights and they respect women in the Egyptian community, how they really look to women as prostitutes or a merchandise for sale and it is fine to take any chance even if it concerned a political party, to fish for sexual relationships. They also discussed how Muslim Brotherhood will support them and support all their activities because the targets are mutual. Call recording between Asmaa Mahfouz, political activist and a man not identified. Asmaa said that she was not calling him, because recently he was chasing other women, and he forgot about her. Asmaa explained that she was receiving training in the Qatari Academy of change and the British Academic in London (SAOS) and she asked the man she was talking to, for his help because they asked her to establish an institution for the tasks she was given. and trained on. (Qatari Academic of change: was established by Qatar and it is financing and supporting the change of regimes in Arab countries including Egypt. Strange that they believe in the regime change in all Arab countries, but not in Qatar the symbol of oppression, slavery and dictatorship! ).